Back in October 2010 Bosch announced their partnership with Perceptron, a global leader in optical scopes. This lead us to assume that Bosch at some point in the future would come out with a 12V inspection scope that would compete with the cordless models from some of the other major brands. 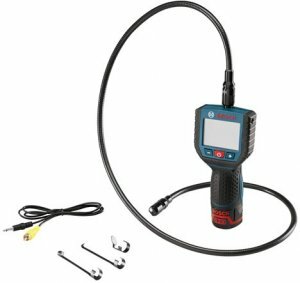 It looks like our prediction was correct, as Bosch has announced their new PS90 12V Max Inspection Camera. The PS90 inspection cam allows people of all trades to get a view of small tight places. The camera comes with a waterproof flexible imager that is a full 48-inches in length and has a camera head that is only 17mm in diameter. The head itself is made out of metal for added durability, and features bright LED lights that Bosch says are configured to provide maximum visibility while preventing hot spots and glare. The camera also can be used with a hook, magnet, or mirror attachments. The main body of the PS90 features a 2.7-inch display, and controls that allow the user to magnify the image up to four times. If 2.7-inches is not big enough for you, the kit also comes with a video output cable that can be used with an external video monitor. The PS90 kit also includes a battery with built-in life indicator gauge, and can be charged in 30 minutes with the included charger. Bosch says the 12V battery provides 8-15 hours of continuous use depending on LED light usage. For users that need to get into even smaller places, Bosch also offer a shorter 36-inch flexible imager that uses a smaller 9.5mm head. If both sizes are needed, they can be purchased together in the PS91 kit. Both kits are available now at Amazon and other stores nationwide.